Enjoy a calm and comfortable complexion with the Magnitone The Clean Sweep Resilience Moisturiser; a fuss-free hydrator that delivers 24 hour moisturisation. Effortlessly gliding over skin and absorbing quickly, the energising formula envelops the visage in a veil on long-lasting moisture, which eliminates current dryness and prevents future occurrences. The moisturiser is enriched with Vitamin B5 and Ginseng, which offer antioxidant and cell-protection properties, whilst stimulating skin’s metabolism. 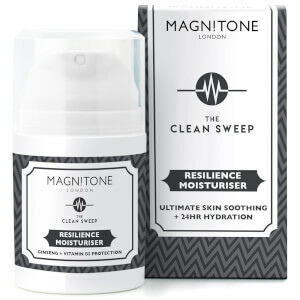 Expect skin to feel soothed, protected and comfortably hydrated. Aqua (Water), Tapioca Starch, Glycerin, Prunus Dulcis (Almond) Oil, Glyceryl Stearate, Cetearyl Alcohol, Peg-20 Stearate, Phenoxyethanol, Theobroma Cacao (Cocoa) Seed Butter, Olea Europaea (Olive) Oil, Parfum, Ethylhexylglycerin, Panthenol (Vitamin B5), Tocopheryl Acetate (Vitamin E), Niacinamide, Sodium Starch Octenylsuccinate, Calcium Pantothenate, Maltodextrin, Panax Ginseng Root Extract, Sodium Ascorbyl Phosphate, Pyridoxine HCL, Potassium Sorbate, Sodium Benzoate, Silica, Benzyl Salicylate, Limonene, Linalool, Coumarin, Butylphenyl Methylpropional, Citronellol, Geraniol, Alpha-Isomethyl Ionone.